This review first appeared in the September 28, 2006 issue of the North County Times. 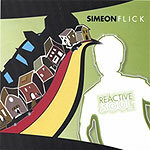 San Diego's Simeon Flick has a new CD out, his third, that is all over the map stylistically. In fact, his MySpace profile page describes his music as "Alternative / R&B / Folk Rock," which is probably as good a definition as exists. But those rather disparate styles aren't mixed together  instead, they alternate, track by track, song by song. The album starts off with a kind of throwback art rock piece a la Boz Scaggs or Rupert Holmes, then on the second song (the advanced copy didn't include song information) starts sliding into an East Coast R&B groove that lasts a couple tracks. The fourth song is a flamenco-flavored instrumental on acoustic guitar; then it's a power-pop bit of alt rock, a couple folk-rock tracks, and so it goes for all 13 songs. While a bit distracting, the thing is that every song is incredibly well-constructed; every arrangement works. And Flick is such a strong, expressive singer that the gear changes don't faze him a bit. That confidence and ability to switch from style to style and back again ends up being one of the album's strengths  the stylistic changes not only hold your attention musically, but it causes you to pay closer attention to each song to see how Flick will approach each new style.